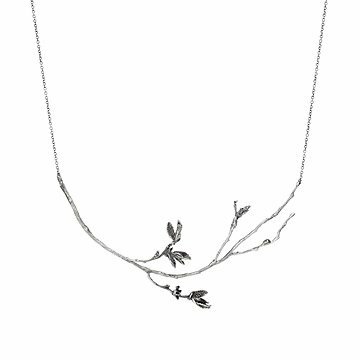 Cast in silver from a branch gathered in Brooklyn, this necklace brings a touch of spring to your ensemble. During a springtime walk through Brooklyn's Prospect Park, artist Judi Powers was taken with a newly-budding tree. A small branch was dangling off it so she took it home and cast it in sterling silver, inspired by the graceful and delicate detail. She then cleaned, polished and formed it to gently rest across the collarbones and attach by a thin silver chain. The winner of our jewelry design challenge, this beautiful necklace lets you carry the joys of spring with you. The delicate silver-cast branch is reinforced with extra soldering, lending strength to its natural beauty. Visit our blog to read more about Judi and her work and inspiration. Judi's a Tree Grows Necklace Wins. Ten years ago, Judi Powers began taking jewelry-making classes. The moment her first piece—a ring—was complete she knew she wanted to be a jeweler. After taking classes at 92Y, School of Visual Arts, and Jewelry Arts Institute over the course of a decade, she quit her corporate life as a marketing director and enrolled as a full-time student at Fashion Institute of Technology where she earned an AAS degree in Jewelry Design. Her greatest sources of inspiration are nature and art and you’ll find their influence throughout her collection. Ferns, sea animals, insects, and pebbles inform shape and texture while elements of Flemish Renaissance art inspire specific pieces. Her love of nature is the primary reason why more than 85% of the metal used in her designs is recycled and the gemstones she uses are ethically sourced: She wants her jewelry to be beautiful without damaging the environment or those individuals from whom she sources from. Every piece of jewelry is happily hand crafted in Brooklyn, NY. When Judi is not working in the studio, you’ll find her working from home with her sweet puppy either curled up on her lap or around her feet. Vist our blog to learn more about Design Challenge Winner Judi Powers and her work! Clean with warm soapy water. Do not use tarnish remover. My wife likes unique jewelry. I thought this item fit the bill. When she opened it up she said it was pretty. She then put it back in the box and has yet to wear it. I guess i missed it this year. A stunning gift for yourself + others!! I love this necklace! It is a true piece of art and looks stunning close up and far away. The delicate chain appears to make the necklace float around your neck. Thanks you for creating such a wonderful piece of jewelry! This piece is beautiful. I couldn't believe how well made it was, and think anyone would love to receive it as a gift.